Following on the heels of a $2.4-million gift from Chancellor H. Arnold Steinberg which launched McGill’s bold new Healthier Societies Initiative, another major gift of $3 million has arrived to improve the training of the next generation of medical leaders. The Richard and Sylvia Cruess Chair in Medical Education has been created by generous gifts of $1 million each from three sets of donors: Mrs. Deirdre Stevenson and Dr. Robert Stevenson, Mr. Herbert Black, and The Molson Foundation. Named in honour of internationally recognized McGill physicians and educators Drs. 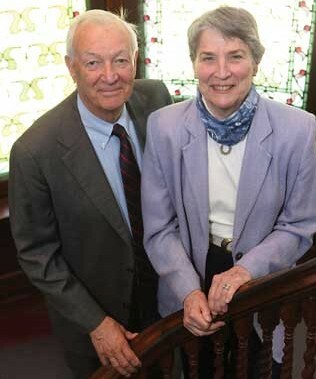 Richard and Sylvia Cruess, the Chair will be awarded to a world-class scholar who will reinforce McGill’s ability to educate talented clinicians and researchers, and who will influence the development of innovative medical curricula and teaching methods around the world. An endowed Chair gives a university the means, in perpetuity, to fund world-class scholars who lead new research initiatives, attract talented students, and heighten international awareness of their expertise. The first holder of the new Cruess Chair is expected to be appointed in February 2011. Based at McGill’s Centre for Medical Education since 1995, Richard and Sylvia Cruess have been recognized for their original contributions to the understanding of medical professionalism and its relationship with medicine’s social contract. They have spoken around the world and published extensively on the definition of medical professionalism, as well as how to teach and evaluate it. Richard Cruess is a former Chair of Orthopedic Surgery and Dean of McGill’s Faculty of Medicine. Sylvia Cruess is an endocrinologist and Professor of Medicine who served for 18 years as the medical director of the Royal Victoria Hospital. Deirdre Stevenson (née Molson), a native Montrealer, has long been a prominent contributor to many charitable causes in the city. Her husband Dr. Robert Stevenson is a McGill graduate (BA’49, BD’61) and a retired professor in the Faculty of Religious Studies who served as McGill’s Dean of Students from 1983 to 1985. Previously, they have funded the Deirdre and Robert Stevenson Award for graduate students in the Faculty of Religious Studies, as well as the South Asian Religions Distinguished Lectureship, along with many other generous gifts since 1949. Herbert Black, a well-known Montreal businessman and philanthropist, is also the parent of a McGill graduate. Since 1986, he has supported multiple areas at McGill from libraries to music to the Montreal Neurological Institute (MNI), including endowing the Herbert Black Chair in Surgical Oncology and funding the Herbert Black Unit for Teaching and Learning in Medicine. This gift continues the extensive legacy of the Molson family, whose transformative support to McGill stretches back to the 19th century. In fact, McGill’s first endowed Chair (in English literature) was established in 1857 with a generous gift from the three Molson brothers, John Jr., William and Thomas. This was the first major benefaction to the University since James McGill’s bequest which founded the University in 1821. The Molson Foundation was established in 1958, and has continued the family’s tradition of support across a broad spectrum of areas at McGill, including athletics, infrastructure, several faculties, and the MNI. The $3-million gift helps to keep the momentum going for Campaign McGill: History in the Making, the University’s historic fundraising drive. To date, Campaign McGill has surpassed $577 million through gifts of all sizes from more than 78,800 donors around the world. For more info please visit www.mcgill.ca/centreformeded and www.mcgill.ca/campaign.